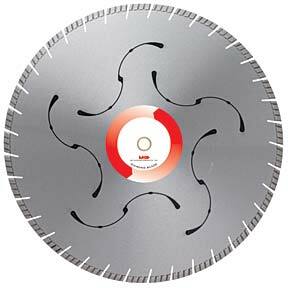 Silent Core diamond blades have a specialized core that reduces vibration and noise. Instead of the standard high-pitched whine, Silent Core blades are significantly quieter. This is beneficial on job-sites where controlling the cutting noise level is an issue and a quieter blade reduces the chance of hearing loss for the operator. Silent Core blades have two designs. The Laser Cut Core has epoxy filled silencing material that provides limited noise reduction/suppression. The Sandwich Core is manufactured with two steel cores laminated with a copper center that provides the greatest sound reduction. approximately one half. Noise reduction depends on a number of factors. material, provides limited noise reduction/suppression. center provide the greatest sound reduction.